A VERY Belated Left Coast Crime Giveaway! I've been reorganizing and shelving books, and guess what I found? Books from Left Coast Crime that I meant to give away! Obviously I put them in that "safe place" we all have in our homes, and it was so safe that I almost never found the books again! Let's get right down to brass tacks and see what all I've got to give away this time! See all those lovely books? They're all signed by the authors, and I even have some bookmarks to go with each set. That's right. Set. As in set of three. 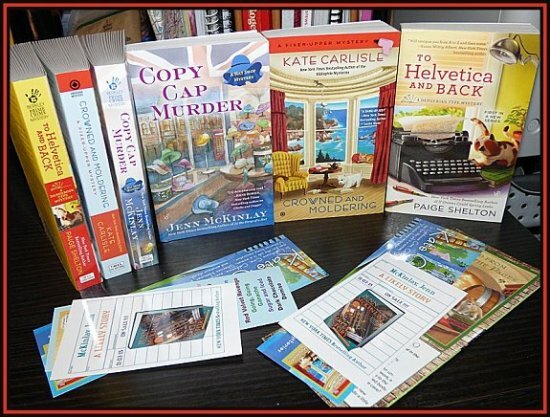 TWO lucky winners will win autographed copies of Paige Shelton's To Helvetica and Back, Kate Carlisle's Crowned and Moldering, and Jenn McKinlay's Copy Cap Murder! To Helvetica and Back is Paige's very first Dangerous Type mystery set in Star City, Utah. Crowned and Moldering is Kate's third Fixer-Upper mystery set in Lighthouse Cove, California, and Copy Cap Murder is Jenn's fourth Hat Shop mystery set in London, England. What do you do to have a shot at winning these three books? All it takes is an email sent to me-- kittlingbooks(at)gmail(dot)com. The subject header of your email must read "LCC Giveaway." The body of your email must contain (A) your email address and (B) your mailing address. That's it! One email containing three necessities. Be careful! If your email is missing one of those three things, you will not be eligible to win. Deadline for your entries is midnight, Tuesday, April 12. 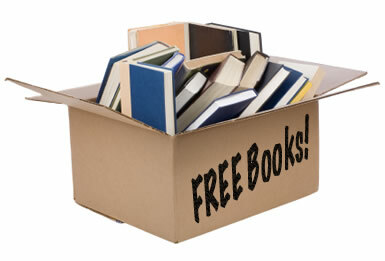 The two winners will be notified by email, and they will be announced here on Kittling: Books on Wednesday, April 13. The last time I had a giveaway, you folks almost buried my inbox alive. Let's do it again-- especially since there will be two of you winning this time! Good luck, everyone! You are so generous, Cathy!! Thanks. Thank you Cathy...what a t-riffic give-a-way! Yes, they are wonderful authors! what a wonderful thing that you are sharing this with us..thank you so much..the 2 lucky winners will be getting some awesome treasures..
Have my fingers crossed! Thank you so much for the chance! My fingers are crossed Cathy. entry sent. I sent an email to enter in the drawling. Got my fingers crossed. Yes, we Cs tend to be rare.